It was sunny and hot for most of the day in NYC yesterday — a welcome break from the rain clouds that have been hovering over us for the past week. And while the humidity was still making it nearly impossible to have a good hair day, I'll gladly take a little bit of sun and summer warmth with the humidity over rain. After a long day of shopping and wandering all over Manhattan on foot, we returned home hot and tired — and I was craving a nice, light meal. 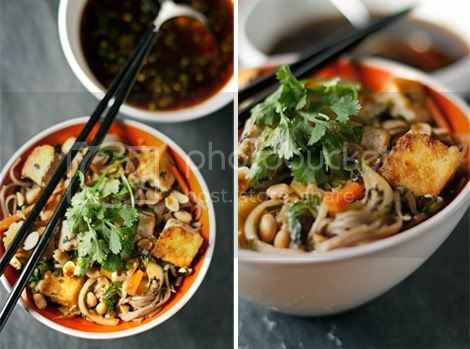 So I came up with a dish inspired by traditional Vietnamese Vegetarian Noodle Salad, or Bún Chay. It takes about an hour to put together, including time for preparing the veggies and tofu, and was a welcome treat after a long hot day. For me, Chinatown is the best place to source these ingredients, but it's not too difficult to find much of what you need at your local health food store or Asian grocer if you have one. I've used buckwheat noodles instead of the usual vermicelli — that's what I had at home already — and added julienned carrot and daikon radish. You can also throw in a little Thai basil and some shitake mushrooms for added flavor and color. I served my bún with deep fried tofu — quick and easy to cook, and the crispy texture is a nice contrast to the other ingredients. You could use marinated tofu instead to add more flavor, baked tofu for a healthier version, or beef, pork, or shrimp for any omnivores in the family. What makes this version vegan? Traditionally Bún Chay is served with a dipping sauce called nuoc cham. Nuoc cham is made with fish sauce, but I've used tamari in my dressing instead of fish sauce to make it pure vegetarian (vegan). 1/3 cup roasted peanuts, chopped, for garnish. Prepare the dressing: In a medium bowl, combine the sugar, soy sauce, and lime juice. Whisk until sugar is dissolved. Add the garlic and chilies and let stand for one hour before serving. While the dressing is sitting, press the moisture from the tofu block by wrapping in paper towels and a kitchen towel, then placing a heavy pan or dish over top. Allow tofu to sit for 30 minutes to an hour, then remove from towels and set aside. Prepare the noodles: Bring a medium-size pot of water to boil, then turn off the heat. Add the noodles to the water and soak until soft, about eight minutes. Drain the noodles, rinsing under cold water, and then drain again. Set aside. Prepare the tofu and vegetables: Add the vegetable oil to a wok over high heat, and heat to 350°. Add the pressed tofu block to wok and fry until golden on both sides, about 3 minutes. Using a wire strainer, transfer tofu to paper towels, reserving the oil. Turn off the heat. When the tofu is cool enough to handle, cut it into half-inch dice, and set aside. Discard all but two tablespoons of the oil in the wok, and return to high heat. When the oil is just hot, add diced tofu, garlic, bok choy, carrot, diakon and chilies. Stir-fry until carrot and radish are crisp-tender, about three minutes. Add mung bean sprouts and tamari; stir-fry just until crisp-tender, two to three minutes. Add half of the cucumbers, and cook 30 seconds. Turn off heat. 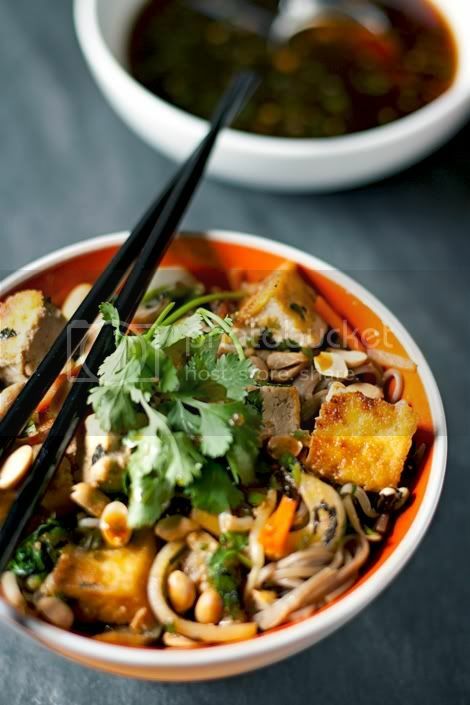 In a large bowl, add together sesame oil, mint, cilantro, and cooked vegetables. Toss lightly to combine. Divide the noodles among four (or two) bowls, and top with equal parts of salad. Garnish with the remaining cucumbers, roasted peanuts and a few cilantro sprigs. Pass the dressing separately, to be spooned over the noodles.